Since the election of Donald Trump, we have seen the resurgence of government efforts to criminalize the life-saving aid No More Deaths provides to migrants in the southwest borderlands. In June of 2017, our humanitarian aid camp on the outskirts of Arivaca, Arizona was raided by Border Patrol and four patients receiving care were arrested. Since then, federal misdemeanor charges have been filed against nine No More Deaths volunteers for our work in the West Desert. In January of 2018, a second raid occurred, this time on our humanitarian aid base in Ajo, Arizona, and Border Patrol arrested two individuals receiving humanitarian aid and No More Deaths volunteer Scott Warren. Scott is currently facing two counts of felony harboring and one count of felony conspiracy. The targeting of our work is part of a larger governmental push to punish and abuse migrants and those who stand in solidarity with them. In response, we are currently mounting a legal defense campaign to demand that charges against No More Deaths volunteers be dropped and that all public lands along the border uphold the right to give and receive humanitarian aid. Sign on to support these campaigns! Wherever you are, you can sign on to our letters to the US Attorney’s office and land management agencies in the West Desert. If you live within Pima County and would like to support our campaign, please invite us to speak in front of your group or order a yard sign and display it proudly. If you live in southern Arizona more generally, consider writing an op-ed or letter to the editor and submitting it to an Arizona publication – we’ll happily provide you with media materials upon request. If you live outside Arizona, we invite you to donate to our legal defense fund (info below) and to get involved where you live with the struggle for immigrant justice. Also feel free to join our local mailing list to learn about upcoming campaign events in Arizona, our national newsletter that goes out about once a month or both! To donate to the campaign, visit our donation page and in the dedication box indicate that you wish for your donation to go the legal defense campaign. 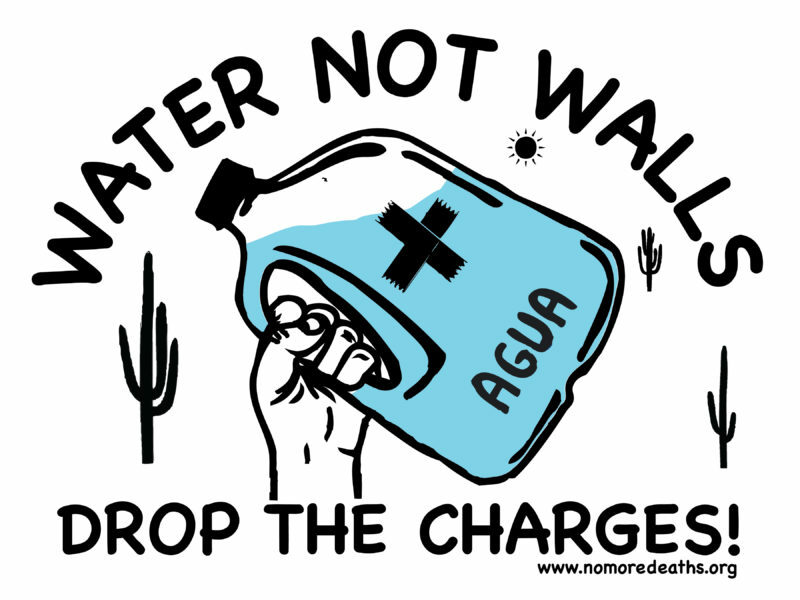 Learn more about our #WaterNotWalls (#AguaNoMuros) campaign to open public lands and our campaign to #DropTheCharges (#RetírenseLosCargos) against humanitarian aid volunteers. Please direct all inquiries to our campaign coordinator.